Reassigning IPs at a clinic can be a daunting, and delicate task, but by following the few simple steps below, you will ensure that SpecVet will work properly. 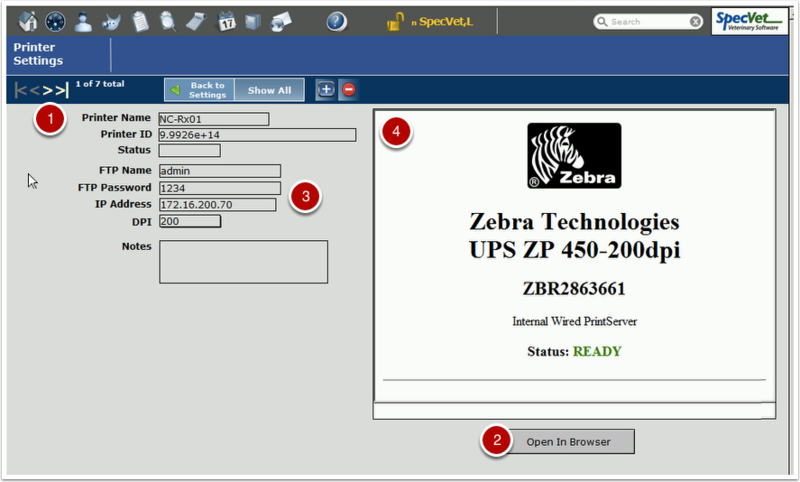 Static IP for each of your Zebra Label Printers (Rx, Collar, Visit). Please provide this list, your general IP schema as well as IPs for other servers (RDC/Terminal Servers, Domain Controllers, File Serves, etc) to SpecVet ahead of time. With that information, SpecVet will prepare a new "SpecVet" Opener File and provide you with the location of where it can be located for you to dissemenate after the change. Change the IP settings in the OS, and do a full restart (OS) of the SpecVet DB server, and the SID Server. Distribute new opener files to all workstations, overriding the existing document. From a workstation, open SpecVet. Change IP settings for your label printers and change the printer's actual IP address. Change IP settings for other labs & interfaces. Validate label printing to all printers. Validate that lab integration is working. From Home in SpecVet, navigate to Setup > Label Printer Setup. Open the printer web setup page in a browser using the FTP Name and Password [Typically it is "admin" and "1234"]. Navigate to Print Server Settings>Print Server>TCP/IP Configuration. Change the TCP/IP Configuration, ensuring that the Protocol is "Permanent" and Timeout Value is 5 seconds. Save Changes, and ensure that the printer does reset/reboot. Validate printer IP address change by printing a configuation label on the printer by pressing and holding the feed button until it flashes one time. Change the IP address in SpecVet. From Home in SpecVet, navigate to Setup > System Prefs and change the Scanned Med Recs IP Address. From Home in SpecVet, navigate to Setup > Settings. Scroll or Filter (if available) for the Setting Name: "dms.ftp.IPAddy". Change the Value to the apprpriate new IP Address. Also from within the ADMIN-Settings page, scroll through and search (or Filter for "IP" if available) any other Setting Names which contain an IP Address, and change the Value as appropriate. If your clinic utilizies the IDEXX Vet Lab Station (IVLS) you will want to contact SpecVet and IDEXX well ahead of time to see if there are changes that need to be made for the Interlink software, as well as on the actual IVLS software. Once all the changes have been made, Quit and Open SpecVet again, and validate that the DMS is working properly, and eventually, that the other interfaces are working properly. At this time, you can have the other workstations Open SpecVet. Keep in mind that if users started SpecVet prior to your completion of changing all the settings, they must restart SpecVet in order for the settings to update.